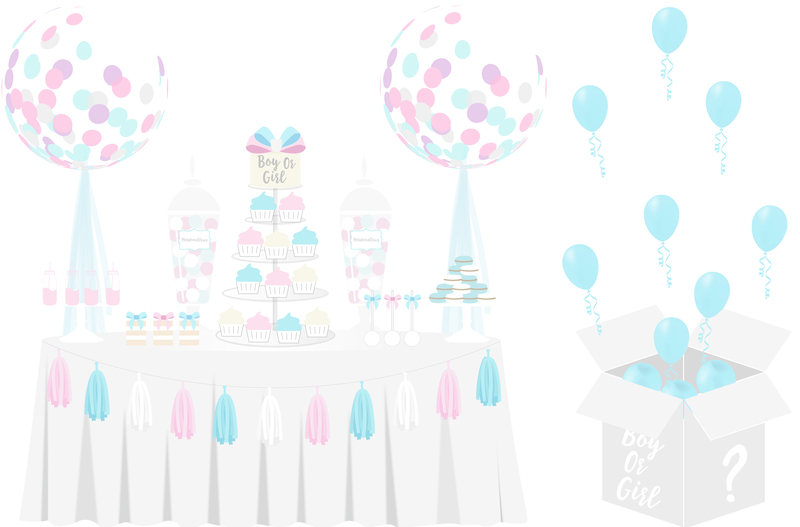 gender reveal balloons & cake packages north west, liverpool & st helens. Five tier cupcake tower filled with personalised cupcakes. See our cupcake gallery. Each cupcake can also be secretly filled with blue or pink buttercream to surprise your guests. Topped with a 5” decorated display cake. View our cupcake tower gallery. Cake table decorated with tablecloth, runner and hand made tissue paper tassel garland. X2 Giant round 3ft confetti filled balloons with tulle tails. Decorated box with pink/blue helium gender reveal balloons that will float out and surprise your guests. Elegantly plated personalised biscuits, chocolates and sweet treats. See our candy buffet gallery. Antonia’s candy buffets are decorated with personalised sweet labels, ribbon detail and come with sweet scoops & treat bags. Large glass bon bon jars filled with sweets and treats to match your colour scheme. To hire our table runners and chair covers in pink and blue please contact us for more information. For additional balloon bouquets see our balloon chart for more information. 5 Tier cupcake tower filled with personalised cupcakes. See our cupcake gallery. Decorated box with pink/blue helium balloons that will float out and surprise your guests with your baby’s gender. 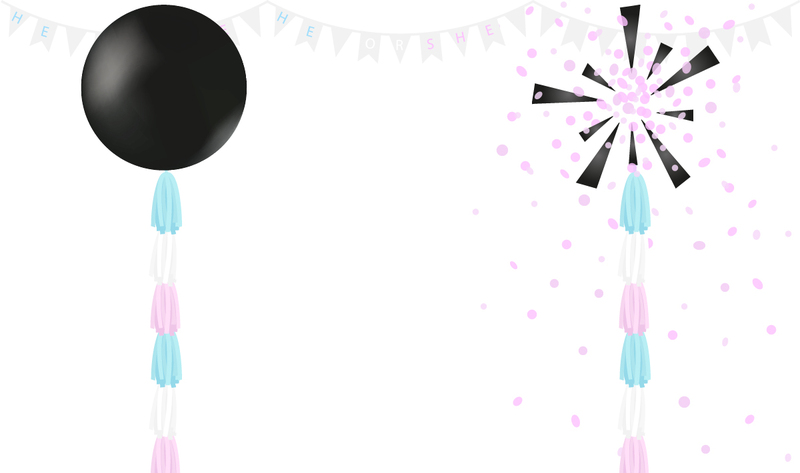 Our gender reveal balloons are a fun and memorable way to reveal to your friends and family whether you’re having a boy or a girl. Each giant hellium balloon is filled with blue or pink confetti, depending on the gender of your little one. The balloons are black, allowing the gender colour to stay secret until the balloon is popped. We can liaise with your 3D scanning clinic, or you can ask them to put the gender in an envelope and drop it at our premises. Once booked in, your ballon will be ready to collect within 30 minutes.